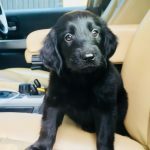 We are very proud to announce the arrival of Zoe, our Flat-Coated Retriever puppy! This makes her the lastest and youngest member of the Doggie Daycare Team. She came to us at only 7 and a half weeks old, weighing in at a mere 2.7kg. Being teeny, tiny and tootsie she is every bit the adorable puppy, but then all puppies are adorable. Zoe’s daddy Ibra is a Calzeat Flat-Coat from frozen Sweden with an host of winning rosettes under his collar. Her mummy Millie is a Bitcon Flat-Coat from sunny Carlisle – her breeder winning Best Puppy in Show at Crufts 2017. We’re hoping little Zoe will be a real head turning Bobby Dazzler too, but we don’t plan to show her as she’s very much a family doggie. Unfortunately Zoe’s not had the best start to life with an upset tummy and a cough making her sleepy and lethargic. Having been to the vet no less than 3 times in the last 10 days, she’s now on antibiotics so hopefully she’ll be bouncing around in a few days time 🐶. Already she’s had her first vaccinations, her Kennel Cough vaccination and has been wormed. So that her little tummy improves, she’s been started on a pro-biotic food supplement to improve her gut flora. Zoe is a special birthday pressie puppy for our youngest team member, Avalon. Avalon is now 10 years old and is super excited to have her very own puppy! Avalon will be responsible for training Zoe and has already taught Zoe her name. She’s gallops towards us when she’s called!